A man walks past a statue of Soviet Union founder Vladimir Lenin installed on the road to the Lenin Hut Museum near Razliv Lake, outside St. Petersburg, Russia, Feb. 25, 2017. In November 2017, some Russians will commemorate 100 years of Bolshevik Revolution. Russia this year is marking 100 years since the Russian Revolution ended the country's monarchy, an event that led to the creation of the Soviet Union, a communist regime that for much of the 20th century ruled an empire. Despite the significant anniversary, Russian authorities have been cautious about how to observe it, apparently fearful of inciting divisions, especially in the wake of a revolution in neighboring Ukraine. The Russian Revolution changed the course of history as the monarchy was replaced by a communist government — the world's first. "These are the greatest events — both February and October [revolutions]," said Boris Rivkin, with the historical cultural museum complex in Razliv. "One should not idealize them. But it was a turning point, a change of the state system, a change in the state of minds and social relations." Russia's communist revolutionary leader, Vladimir Lenin, hid near the museum's countryside location for a few days in July-August 1917 in a shed, as well as a shelter made out of hay. A giant cement bust of Lenin sits near the woods outside the museum, which tells the story of Russia's Bolshevik leaders and has a small exhibit of modern art paintings of Lenin. Despite the collapse of the Soviet Union in 1991, its global influence continues to be felt, from former Soviet republics to other communist movements it inspired, and from Asia to Africa to South America. "It is impossible not to mark the revolution at all. This is a global event, and it affected the entire history of Russia and the whole world," said the State Museum of Political History's Sergey Spiridonov. "But it is quite unclear, both for the authorities and many other people, whose side to choose in this revolution," said Spiridonov. "We do not seem to support Bolsheviks anymore; we try to avoid this situation, to keep a distance from the Bolshevik ideology. But nevertheless, we realize that the present Russia is a successor of the Soviet Union." In contrast to the Soviet era, however, the Russian Revolution's centenary observances are being played down by Russian authorities, who instead are urging reconciliation and unity. 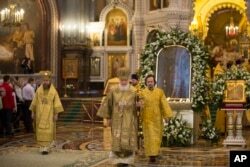 Russian Orthodox Patriarch Kirill, center, conducts a service in front of the the icon Mother of God Reigning, at second right, at the Christ the Savior Cathedral in Moscow, Russia, Feb. 19, 2017. The requiem was in memory of the victims of the faith, in connection with the centennial of the February Revolution in Russia in 1917. "It is clear now that it is no holiday! Though this is quite a grand, significant and commemorative event for our country," said Spiridonov. "The president [Vladimir Putin] was probably right to some extent when he called for a certain national reconciliation in connection with this date, because we have not yet survived through the situation of the revolution to the very end." Spiridonov said a democratic Russia would probably be expected to honor the Provisional Government, which came to power immediately after the popular uprising against the monarchy but was then overthrown by Lenin and other communist leaders. "There is no split in society in relation to these events, but authorities are concerned about that," said the Saint Petersburg Institute of History's Igor Lukoianov. "And, they try by all means to be quite cautious in assessing those events, so as not to cause again an antagonism in society." 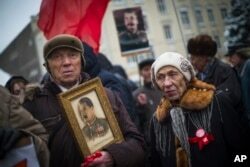 FILE - A man holds a portrait of Soviet dictator Josef Stalin during a demonstration marking the 99th anniversary of the 1917 Bolshevik Revolution in Moscow, Russia, Nov. 7, 2016. Unlike the past, Nov. 7 is no longer a public holiday in Russia. On this 100-year anniversary, the Soviet Union's many victims are remembered as much as its achievements. The Russian Civil War, Stalin's Red Terror and Russia's involvement in World War II cost the lives of countless millions. The 2014 Ukrainian Revolution reinforced Russia's wariness of movements and radical political change at home. Russian officials called the popular uprising against Ukraine's former Moscow-leaning President Viktor Yanukovych a "coup" backed by Western governments. Yanukovych fled to Russia, which annexed Ukraine's Crimean Peninsula and launched military support for rebels in eastern Ukraine. Since the collapse of the Soviet Union, Russians increasingly refer to the "Bolshevik Revolution" as the "October Coup." "There is a difference between a coup d'etat and a revolution with masses [of people] involved," said Lukoianov. "I shall not take a risk to answer that it is the last one, but it might not be a surprise to me that power might be changed and possibly by a nonconstitutional method." A century later, the 1917 revolution that shook Russia and the world is no longer a cause for celebration, but a time for contemplation.